Look at that sell-off on USD/JPY! After it had traded within a tight range for the entire Tokyo and London trading sessions, the pair experienced a huge drop to the downside. 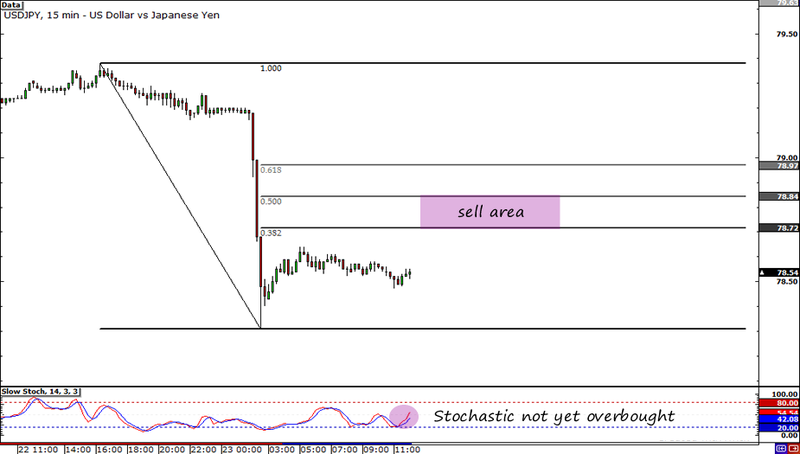 It marked the third straight day that USD/JPY ended the day lower than its open price. Based on my analysis of the daily chart, the pair seems to be at the beginning of downtrend. Given this, I think the pair still has the potential to go lower today but given how strong the move down was, I believe a pullback will happen first. I’m thinking of taking a day trade on the pair by jumping in around the 38.2% Fibonacci retracement level once Stochastic hits the overbought territory. I’ll aim for yesterday’s low but I’m open to holding my position even longer if the trade moves fast in my favor. As for my stop, I’ll place it around the 79.00 handle. For the most part, I want to short the pair because of the most recent FOMC meeting minutes. Pip Diddy reported that the minutes caught a lot of investors off-guard when it revealed the Fed’s eagerness to launch more stimulus measures. The central bank has been pretty vague on its stance regarding monetary policy for the past few months and the latest minutes provide the markets with the much-needed clarity. In my own opinion, I think it’s a game-changer and we’ll see the dollar continue to chalk up losses in the next few days. But of course, I could also be wrong. With that said, I’ll be sure to be on my toes for reversal candles around 78.70 and for Stochastic to indicate overbought conditions before pulling the trigger. I’ll be sure to keep you updated so follow/add me on MeetPips, Twitter, Facebook, and Google+!